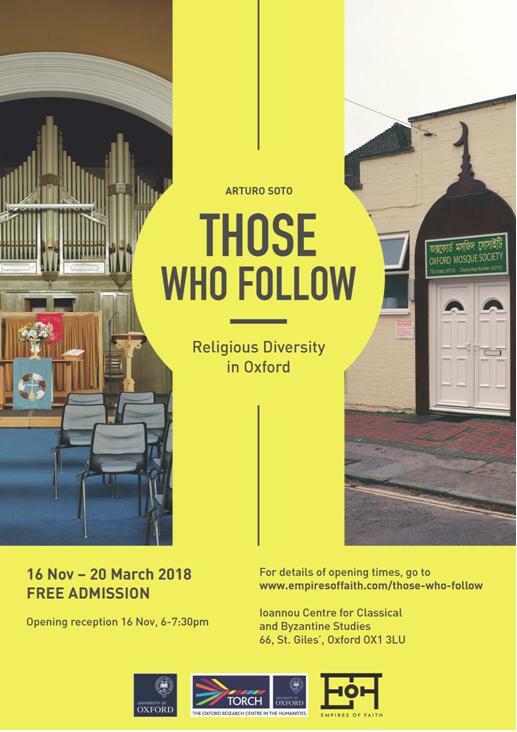 Empires of Faith is hosting Those Who Follow, a photographic journey across Oxford’s modern religious spaces by photographer Arturo Soto. The exhibition is in part an artistic response to Imagining the Divine, bringing the incredible histories of art and religious material culture into the present day and showcasing the diversity of the Oxford community. Those Who Follow confronts us with buildings we might pass everyday, that are part of our lives but that we don’t often pause to consider – affording us the opportunity to reflect on those that by contrast are prominent, distinctive, and immediately communicate ideas about faith. The exhibition goes behind the facades to explore how these buildings work for their communities from inside and out, both as spaces of worship and as places of the community. For further details about attending the exhibition, the vision behind the photographs, and on free events running around Those Who Follow, see the links below. The project has been made possible thanks to the generous support of the Oxford University John Fell Fund, The Oxford Research Centre for the Humanities (TORCH), and the Ioannou Centre for Classics & Byzantine Studies.